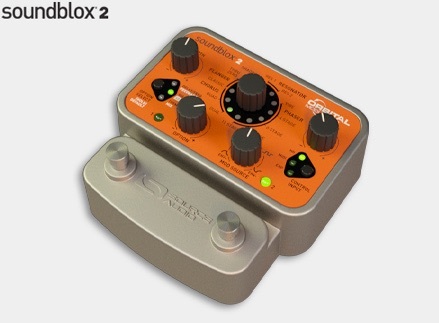 The Soundblox 2 Orbital Modulator is a super-compact, durable, and highly flexible multi-effects pedal with a dynamic collection of precision-engineered phaser, flanger, chorus, and tremolo effects. Twelve effect types, nine adjustable parameters, plus internal or external modulation control, emphatically elevate this micro-monster well beyond the sonic limitations of traditional modulation pedals. The Orbital Modulator’s rack-mount power delivers endless modulation possibilities including multi-voiced choruses, through zero flange, rotary speaker simulation, variable notch phasers and much more. Its nine adjustable parameters include DEPTH, FEEDBACK, DELAY, FREQUENCY, VOLUME, LoRETAIN, TREMOLO, MIX, and SPEED. Control modulation either internally or externally: sine and square wave LFO plus forward and reverse Envelope Followers offer vibrant internal modulation, while the pedal’s compatibility with MIDI control signals, the Source Audio Dual Expression Pedal, or any of our Hot Hand motion sensor rings provides precise external control. Once you’ve dialed in the perfect sound, save it one of two user presets easily recalled via two footswitches. The unit also comes with a 9VDC power supply. 1Diverse Sound Palette — Featuring 3 Chorus, 3 Flangers, 2 Resonator Flangers, 5 Phasers and Tremolo. 49 Adjustable Parameters — Depth, Delay, Frequency, Feedback, Volume, LoRetain, Tremolo, Mix, and Speed. 56 Modulation Sources — Sine Wave LFO, Square Wave LFO, Envelope Follower, Hot Hand, Expression Pedal, and MIDI. 6Multi-function In — use the Source Audio Dual Expression Pedal or any of the Hot Hand Motion Sensors for on-the-fly control over modulation or any of the 9 adjustable parameters. 7Universal Bypass — selectable buffered or true bypass. 8MIDI Capable — the Multi-function In jack also allows MIDI access to presets and parameters. 9State-of-the-art DSP — Our proprietary 56-bit Digital Signal Processor, the SA601, and crystal clear 24-bit converters. 11Dimensions: L: 4.5 in./11.4cm x W: 4.5 in./11.4cm x H: 2.25 in./5.7cm (including knobs). 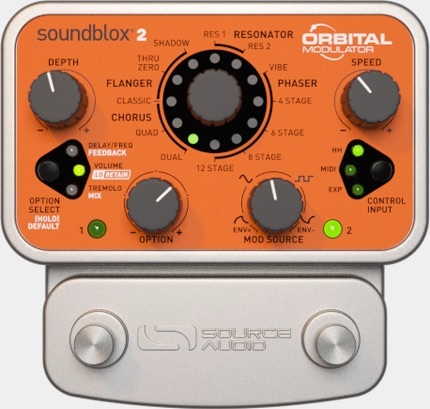 Source Audio, innovators of the award winning Hot Hand® Motion Controlled Effects and Soundblox effects pedals are introducing the Soundblox 2 Orbital Modulator. The Orbital Modulator is a combination phaser, flanger, chorus, and tremolo modulation effects pedal, designed to work equally well with guitar or bass. This powerful cast-aluminum stompbox offers rack-mount function and flexibility in a surprisingly compact 4.5 x 4.5 inch footprint. Source Audio introduced The Orbital Modulator at the 2013 Winter NAMM Show in Anahiem, CA where it received praise from both Guitar Player and Premier Guitar magazines. Guitar Player called the pedal, "an insanely flexible, killer sounding mod box that runs the gamut from classic to otherworldly." Premier Guitar raved that the O-Mod packs "just about every modulation flavor imaginable with some extra Source Audio tricks and filters." The Orbital Modulator offers three chorus effects from a classic single voiced chorus to mega-lush two and four voiced effects. Its five flavors of flanger include a remarkably realistic tape flange (aka through zero flange) and two thoroughly unique Resonator flangers. Five luscious phaser effects range from a simple Uni-Vibe inspired modulation to highly complex 8 and 12 stage phasers. Tremolo can be embedded into any of the Orbital's effect types for dramatic three-dimensional effects like rotary speaker simulation or thumping chopper-like amplitude modulations. Each effect type offers an endless range of possibilities with nine adjustable parameters including DEPTH, FEEDBACK, DELAY, FREQUENCY, VOLUME, LoRETAIN (Source Audio's own low-end preserving algorithm), TREMOLO, MIX, and SPEED. In an effort to make the Orbital Modulator totally user friendly, a reset function has been included, which automatically sets any of the effects to a meticulously fashioned default setting personally dialed in by Source Audio's tone obsessed engineering combo of Bob Chidlaw and Jesse Remignanti. Users can save two presets that are easily recalled via two footswitches. Plus, the Orbital offers "Universal Bypass" which offers a choice between true-bypass or a special analog buffered bypass. The Orbital allows users to control each effect's modulation either internally or externally. Sine and square wave LFO offer vibrant internal modulation with on-the-fly Tap Tempo SPEED adjustment. Plus forward and reverse Envelope Followers offer effect modulation reactive to incoming guitar or bass signals. The Orbital is also compatible with MIDI control signals, the Source Audio Dual Expression Pedal, or any of the Hot Hand® Motion Sensor Rings. Each external control device operates effect modulation or can be assigned to any of the nine adjustable parameters. Source Audio's proprietary state-of-the-art 56-bit Digital Signal Processor and 24-bit converters deliver precision control and pristine sound quality well beyond most analog pedals and many of the over-sized digital units on the market today. The unit comes with a 9VDC power supply. Source Audio was founded in January 2005 by former engineers, scientists, and executives of Analog Devices, Kurzweil Music Systems, and Thomas H. Lee Partners. 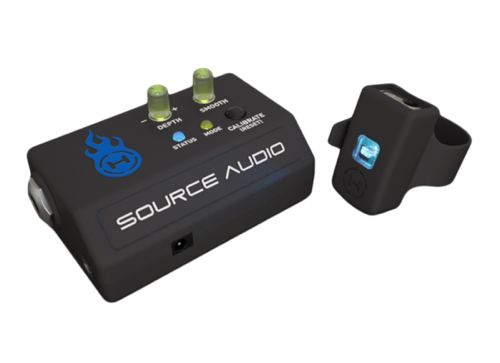 Since the 2006 release of its flagship product, the Hot Hand motion-sensing ring, Source Audio's distortion, modulation and Hot Hand products have been recognized through multiple awards from Guitar Player, Guitar World, Bass Player, and Premier Guitar Magazines.